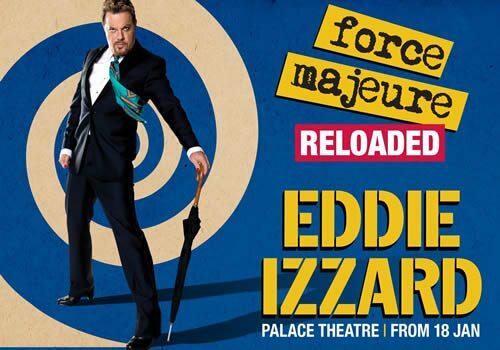 Popular British stand-up comedian, writer and actor Eddie Izzard is returning to the West End with Force Majeure Reloaded, a spruced-up version of his 2013 show. Izzard arrives at London’s Palace Theatre for a limited four-week run from January 18th 2016. Force Majeure originally opened in 2013, receiving less than inspiring reviews. After touring it in over twenty countries in four different languages, Izzard hopes to bring a “reloaded” version on his return to London. From Moscow to the Hollywood Bowl, Izzard’s epic tour has seen him travel all over the world, bringing his comedy with him. Taking up residency in one of London’s theatres is a rare move for Izzard, who is known for his extensive international tours. Known for his rambling, stream-of-consciousness style of comedy, Force Majeure Reloaded will combine a whole new set of jokes amongst deconstructions of Greek myths, political jibes and historical tales. He will present a variety of bizarre sketches that promise to deliver plenty of laughs. After previously announcing that he is going to stand for Mayor of London in 2020, Izzard has often swayed from comedy to politics, but interestingly is adamant that there is a thin line between the two. Izzard’s stand-up is surreal and unlike any other comedian, using visual aesthetic combined with intelligent yet hilarious jokes and anecdotes. Force Majeure Reloaded will run for a limited season from January 18th to February 13th at the Palace Theatre London. Will contain inappropriate jokes of a nature that children will not understand. Click here for the Palace Theatre seating chart and seat price guide.